Dispatches from LALA Land: Radar L.A. 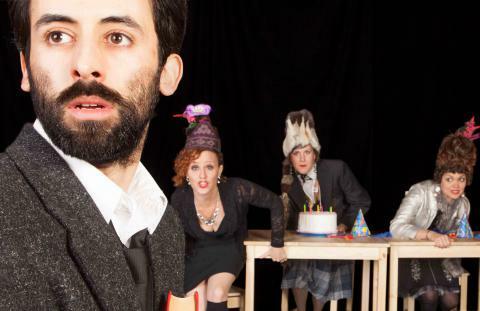 The 2013 Radar L.A. interdisciplinary theater festival brought artists from around the world to perform alongside and in collaboration with Los Angeles theater artists. Presented by REDCAT and CalArts in association with Center Theatre Group, and curated by Mark Murphy of REDCAT, Diane Rodriguez of Center Theatre Group, and Mark Russell of The Public Theater in New York (yeah, it was that collaborative), this year’s festival featured 18 productions from the United States, Argentina, Mexico, Chile, Colombia, New Zealand, Japan, and the Netherlands. The first Radar L.A. was held two years ago when TCG held their annual conference here. Co-curator Diane Rodriguez told me that she and her collaborators had already begun discussing creating a festival with national range, and the conference provided a perfect opportunity to launch it. This year, she says, though some professional theater makers came from elsewhere for a symposium that was part of the festival, the local audience also turned out in droves. The festival expanded its geographical reach to include The Getty Villa in Malibu, the Grand Central Market, and theaters downtown as well as the Kirk Douglas Theatre and REDCAT. And this time around, the festival not only presented existing interdisciplinary theater pieces, it also commissioned and co-produced new work from both local and international artists. I managed to take in five shows, including two solo performances, a collaboration between a Los Angeles theater company and one from the Netherlands, a deconstructed version of Anton Chekov’s Three Sisters created by a local group, and Prometheus Bound. Roger Guenveur Smith in Rodney King and Trieu Tran in Uncle Ho to Uncle Sam used the instability of identity inherent in solo shows to tell stories about that most volatile of subjects: race in America. Theatre Movement Bazaar‘s Track 3 used a combination of spoken text, song, and dance to tell the whole story of Three Sisters in seventy five minutes using nothing more than a table, chairs, a few books, and some teacups. 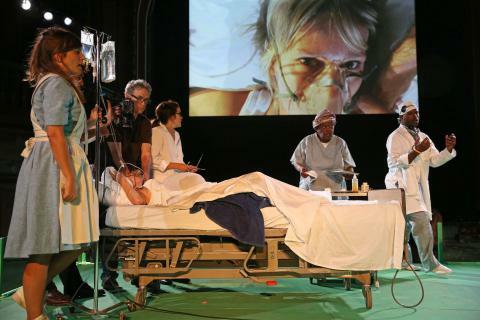 One of my favorite shows, Hospital, resulted from a collaboration between a local performance group called The Los Angeles Poverty Department and the Netherlands-based collective Wunderbaum. Reminiscent of the WPA’s Living Newspapers—a Depression-era theatrical tradition that showcased current political events, Hospital uses the story of one real-life participant in the health care systems of both the United States and the Netherlands to address the larger health care issues facing both countries. This combination of music, dance, video, and personal narrative, delivered both through reenactments and direct address, was at once both a defense and a criticism of Obamacare as well as of the Netherlands’ entirely nationalized health care system. Much like Living Newspapers existed to address national problems with concrete proposals, Hospital even goes so far as to pose a possible long-term solution to our collective health-care woes. 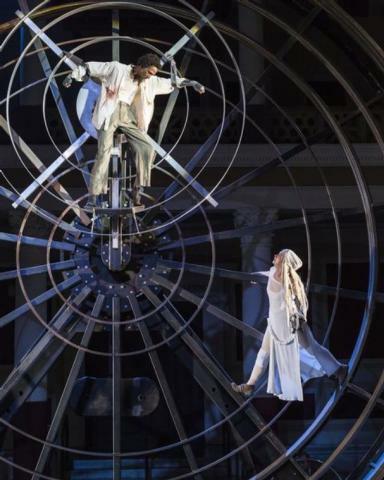 The largest-scale production I saw was Travis Preston‘s Prometheus Bound at the Getty Villa. Preston, who commissioned this new version of Aeschylus’s metaphysical tragedy, said he was looking for a translation that uses language to clarify the internal action that moves the play—after all, the only physical action dictated by the text is Prometheus getting nailed to a rock. What movement existed in performance derived from Preston’s use of the amphitheater, such as the aisles between sections of the audience and the acoustic effects of such open-air stone theaters; a chorus of twelve women that moved and spoke as one; and the turning of a massive metal wheel that represented the rock to which Prometheus was tethered. Preston added that through extended workshops and rehearsals, he found that “the piece resisted any decorative impulses.” He aimed rather to invoke the kind of iconography that would allow the audience to infer and project their own meanings onto the performance. The wheel spoke simultaneously of industrialization and of the medieval wheel of fortune, while the Chorus seemed to embody both water and birds. Live musicians gave even the most philosophical portions of the text forward motion, while also creating a meditative rhythm that harkened back to the communal nature of Attic tragedy as originally performed. By not making the production an explicit commentary on slavery or race relations, Preston enabled the audience to make that connection themselves, providing for a far more imaginative and less didactic experience than simply setting the play in antiquity would have. Similarly, though Preston believes the play to be proto-Christian in its emphasis on sacrifice, the lack of overt Christian symbols allowed the audience to read the performance both from a religious perspective, in which the essential questions it asks are about obedience and sacrifice, and from an existential one, in which the question is whether life really consists of anything more than suffering. The combination of dance, music, and spoken text used in Prometheus Bound perfectly encapsulated Radar L.A.’s interdisciplinary focus. As to the future of the festival, Murphy shared the specific role he wants Radar L.A. to play in creating new work in Los Angeles. The feminist in me cannot help but point out that ticket prices for Radar L.A. and the connected symposium are high enough that audience members and participants are, as one symposium attendee pointed out, “sitting in seats of privilege.” Nonetheless, Radar L.A. confirmed a suspicion I’ve had for some time now: That Los Angeles is currently one of the most interesting places to make and see theater in America. Track 3 by Theatre Movement Bazaar. Photo credit: Joey Bernheimer. Marleen Scholten, Maartje Remmers, John Malpede, Linda Harris, Walter Fears, and other cast members in Wunderbaum/LAPD’s Hospital at Radar L.A. festival. Photo credit: Steven Gunther. Ron Cephas Jones as Prometheus; Mirjana Jokovic as Io carried by the Chorus. Prometheus Bound at the Getty Villa. Photo credit: Craig Schwartz.